No lawyer comes forward to defend Shazia Bashir, the servant girl murdered by her employer. The powerful association of lawyers in Lahore, arrayed in defence of the murderer, launches death threats and prevents access to the Court. Christian Association condemns this new form of terrorism. Islamabad (AsiaNews) - Because of the threats posed by the powerful Lahore Bar Association – an umbrella organization of city lawyers - no Christian or Muslim lawyer is ready to take on the defence in the murder of 12 year-old Shazia Bashir, it was reported yesterday by The Pakistani Christian association that deals with legal assistance. The girl, of Christian faith, died on Jan. 23 as a result of violence - even sexual – at the hands of her employer, a wealthy and powerful Muslim lawyer in Lahore. 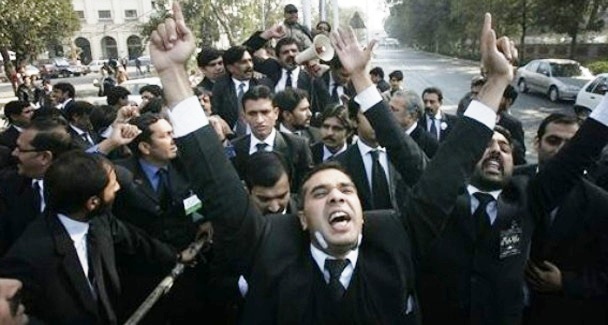 The alleged murderess, Chaudhry Mohammad Naeem, is a former president of the Lahore High Court Bar Association. The girl, just 12 years old, had worked as a maid in the home of Naeem in the last six months. The Center for Legal Aid Assistance and Settlement (CLAAS) denounces that access to the courtroom where the court hearings were held against the accused was denied, because a group of Muslim lawyers (pictured) 'prevented' entry. The association is fighting - for free - for the rights of the poorest and marginalized groups has been threatened by thousands of lawyers - friends of the murderer - that promise to burn alive anyone who wants to represent the victim in court. " M. Joseph Francis, director of Claas, asked members of civil society, political and religious leaders to rise up and take steps to "condemn this new form of terrorism" by lawyers who "should ensure justice." The Pakistani newspaper The News reported that on Feb. 4, the police conducted the accused to the courts amid "tight security. And, as usual, officials prevented journalists and relatives of victims to come into the hall for "security reasons". Shazia Bashir's family could not access the court not once but three times, a strange fact, regarding the judiciary in Pakistan. Police officials explain that it would "not be possible" to prevent clashes and violence, where "Shazia's relatives and representatives of minorities to enter the courtroom." Meanwhile Ashgar Ali, heading the investigation, requested the accused appear before the courts and an extension of the terms of custody for six days. The magistrate added that the murder weapon has not yet been recovered and the accused could provide the names of accomplices, who participated in the torture and murder of the 12 year old Christian girl. The court, however, has only partly accepted the request, ruling only four days in jail.